'The V&A was founded as a contemporary museum. Purpose-built on a green-field site, its first deliberate collections were selected from brand new products sent from all over the world to the Great Exhibition of 1851. The Museum was, therefore, certainly a showcase for new products. However, what made it a contemporary museum has much to do with promoting the economic growth of the country as with its role as a repository for new products of comparative design.' The quote is from Susan Lambert, first Chief Curator of the Contemporary at the V&A, explaining in an article for Conservation Journal in 2000 that while her role and department was new for the museum at the time, the V&A had – at least at the time of its foundation – a contemporary remit. Indeed the V&A was founded as a contemporary museum in the 1850s (though it was not called the V&A until 1899), at a time of great design reform in Britain, charging itself with the role of educating artists, manufacturers and the general public in the importance of good design through the collection and display of key examples of quality contemporary design and manufactures. Though one could argue it has sometimes lost sight of its aims to display and influence contemporary decorative arts and design (having gone through various phases of collecting only old objects), in recent decades matters of the contemporary have once again come to the fore of the V&A's offering. The introduction in 2000 of the Contemporary department, now named Contemporary Architecture, Design and Digital, aimed to reposition the contemporary within the museum and its programme and, as a result, reengage the museum's audience. While the V&A collects the contemporary (notably through its new, highly publicised 'Rapid Response Collecting' approach) and cultivates the contemporary by enabling artists and designers to create new work through the museum's residency programme and regular commissions, I've taken a look at the importance and efficacy of the V&A's contemporary exhibitions and events programme in ensuring contemporary art and design is a key part of the museum's activity and a real draw for new and old audiences. For all its holdings of old and historic objects, the V&A is – as intended at its foundation in the 1850s – a museum of contemporary art and design. Within the context of London, one of the world's creative capitals, while other institutions also engage with the contemporary, it is the V&A that does so more extensively and effectively. And while its programme is brilliantly curated, I've taken a look at the many elements that enable the V&A's contemporary programme's success beyond its curation. Curation alone will not make a programme – contemporary or otherwise – a successful one. Context, timing, pricing and more affect who can engage with a programme and how they engage with it. As such, you can read on about the importance of free admittance, late evening access and the particular placement of contemporary exhibitions within the V&A's labyrinthine building in ensuring that a large and broad audience enjoys the contemporary programme. The V&A is not a place for old objects to go and die, rather it is the place where contemporary objects – and the processes through which they are made – come to life. Upon entering the V&A's Grand Entrance from Cromwell Road you would be forgiven for feeling overwhelmed. A central information desk sits below a 27ft long blown glass chandelier; an explosion of blues and greens and yellows by contemporary glass artist Dale Chihuly. Before you have reached the information desk you see marble arches and stairs on either side of you, leading you to galleries, cloakrooms and bathrooms. Past the information desk you see the Museum's massive shop, glowing with light and brimming with things to buy. Invariably, you are surrounded by hundreds of other people on their way in and out of the Museum, many of whom (perhaps like you) aren't sure what they're looking for or where to go to find it. Take a breath and take a minute, and you might discover that to the left of the information desk is the Porter Gallery, a temporary exhibition space. This exhibition space, the first you will encounter on your visit to the Museum (unless you enter from Exhibition Road), is a space which will almost always contain a free exhibition, and that exhibition will always focus on the contemporary in some form or another. While it may have to battle for your attention as you try to orientate yourself in the entrance hall of a giant and busy museum filled with millions of objects spanning centuries of production, the contemporary is right there waiting for you as soon as you arrive. While the Porter Gallery, something of a self-enclosed blank canvas amid the otherwise weighty and opulent surroundings of the V&A, offers the V&A's curatorial team the space to explore potentially really interesting concepts and play with innovative exhibition design, I think the key thing about this gallery is its positioning. The V&A's contemporary gallery is not buried somewhere in the basement, or at the end of one of the many circuitous routes a visitor may find themselves taking through the building. Rather, it is placed (just left of) centre stage. It is one of the easiest gallery spaces to access in the Museum and should potentially enjoy great footfall. This prime position is not given over to some of the Museum's amazing Asian antiquities, its stunning silverware, its glorious glass collection or any other category of old object. It is given over to the contemporary, showing the V&A's renewed commitment to presenting contemporary work to its audience. The word 'contemporary' is defined by the Oxford dictionary as 'belonging to or occurring in the present'. It is a word whose meaning is inextricably linked with time, and, as it happens, I believe time, or perhaps timing, is an important factor in museum programming. Alongside presenting contemporary art and design through temporary exhibitions, the V&A explores and celebrates contemporary work through a programme of events that includes fashion shows, talks and the now famous Friday Lates. Events occur at various times of the day all days of the week, and timing can dramatically effect one's ability – and eagerness – to attend. The V&A's Friday Lates are themed events held from 6 – 10pm on the last Friday of every month. Free to attend, without the need to book in advance, each Friday Late features a number of talks, screenings or demonstrations, along with workshops, installations, music, food and drinks. A Friday Late could take its inspiration from one of the Museum's current exhibitions (the first Friday Late I ever attended was an '80s night, in celebration of the V&A's 'Club to Catwalk: London Fashion in the 1980s' exhibition of last year), it could be a 'takeover' by one of the city's creative communities or could take another theme altogether, such as the Museum's most recent Friday Late on 28 November 2014 entitled 'What the Font?' looking at typography in all its forms. Any Friday Late I have attended has had a strong programme of varied events. Most recently I attended 'Collections of Collections' on 31 October 2014, which explored not the Museum's own collections but rather the pursuit of collecting as a compulsion that many people have. I entered the Grand Entrance to the sounds of the record collection of artist David Blandy, I saw the personal collections of some of the V&A staff (including a crazy amount of Spice Girls memorabilia), I attended a tour of the Museum of Imaginative Knowledge which collects ephemera from the Scottish village of Angarth and I narrowly missed a presentation on a collection of stationery and office tools. I enjoyed everything and – had I been a little more organised – I could have gone to another few talks and presentations which would have been equally interesting. However, to focus solely on the programme of a Friday Late is, to me, to miss the point of it. A Friday Late could have a jam-packed, carefully curated programme (and these nights usually do), but even if they didn't, much of the novelty of a Friday Late comes from the fact that it allows you to enter the Museum in the evening. 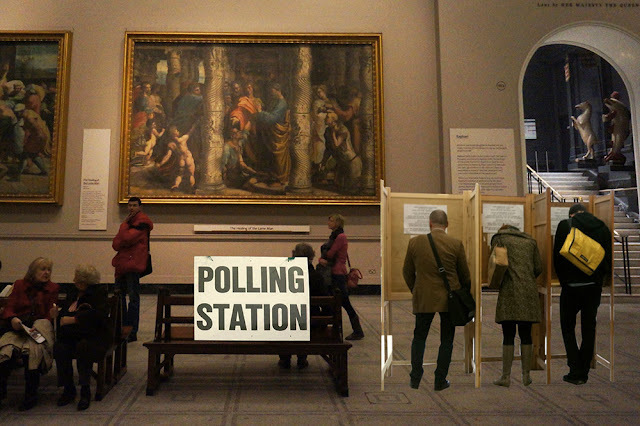 It allows you to do so for free, and through music, food and drinks, it heightens the social aspect of a museum visit. The V&A's founding director Henry Cole believed that amenities such as the Museum's restaurant and evening openings might, in typical Victorian do-goodery, 'furnish a powerful antidote to the gin palace', and I can certainly understand his reasoning. I have often enjoyed a Friday Late not just for its cultural offering but as a way of meeting and catching up with friends or letting off steam at the end of the week, and doing so in beautiful surroundings without costing the earth. Museums all over the world have felt the need to expand and diversify their offering in order to do the same with their audience. The V&A is no exception, seeing massive drops in recent decades both in their government funding and their visitor figures. The Contemporary programme has played a key role in increasing both. Fashion in Motion, the V&A's series of regular fashion shows begun in 2000, is another interesting aspect of the contemporary programme. Presenting the work of contemporary fashion designers, Fashion in Motion allows members of the public to attend a free fashion show within one of the Museum's galleries. While it is not a direct income generator, I believe it does bring the Museum increased visitors by offering them something they could not easily experience anywhere else. I attended on 17 October 2014 to see the haute couture womenswear collection of Ralph & Russo in the incredible surroundings of the V&A's Raphael Gallery. Since then there has been a showing of the work of London-based knitwear studio Sibling, while past highlights include Vivienne Westwood, Issey Miyake and a host of other major fashion names. Fashion in Motion offers its audience the chance to see incredibly high quality fashion up close, not static on a mannequin but on a model moving through space, which is a distinctly different experience than seeing a garment exhibited or hanging in a shop. What I also consider to be particularly special about Fashion in Motion is that it breaks down the exclusivity of the fashion show and invites a wider audience in. 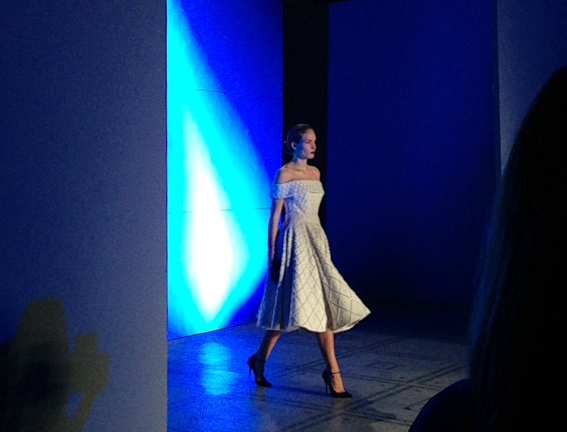 Fashion shows – particularly those of the fashion labels shown in Fashion in Motion – tend to occur during fashion weeks. And fashion weeks can usually only be attended by those in the business – designers, retailers and press. I had never experienced a live fashion show before attending Fashion in Motion last October. Not only did Fashion in Motion enable me to have that experience, it gave me the opportunity to do so free of charge and in impressive surroundings. An event such as this is the closest to democratised that haute couture will ever get. 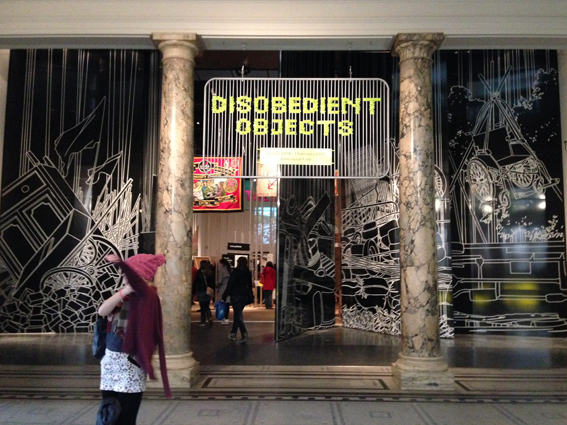 Exhibitions such as Disobedient Objects and All This Belongs to You clearly look to the world outside the museum to reassess the position both of design itself and the museums that display it in the world. It should be noted that this heightened awareness of the key relationship between design and the social or political context in which it is created or used does not exist solely within some of the V&A's exhibitions and events. The Department of Contemporary Architecture, Design and Digital has introduced a new, speedier method of acquiring pieces for the V&A's collection called 'Rapid Response Collecting'. And while the speed at which objects are acquired is one novel aspect of the 'Rapid Response' approach, arguably more noteworthy is the fact that the objects acquired through it are clearly more politically or socially charged than many of the types of objects previously collected by the Museum. Long has posited that his department is not simply one of contemporary design, but rather a 'department of public life', suggesting a renewed interest in the relationship between design and the world in which it exists. Curation in the V&A is becoming properly aware of the context in which it exists and, importantly, more accountable to the public it serves. This isn't the first time that the V&A's curatorial approach has tuned into the goings on in the wider world since its foundation under director Henry Cole. Notably, in the 1970s when the V&A was under the directorship of Roy Strong, the V&A mounted a number of 'campaigning' exhibitions such as The Destruction of the Country House 1875 – 1975 (1974) and Change and Decay: The Future of our Churches (1977), commenting on current social issues as well as tapping into the era's increased interest in heritage. As writer Anthony Burton suggests, 'these exhibitions, all with important effects, showed that the V&A could argue a case (as distinct from presenting a pretty show), which it had not chosen to do since Cole's “Chamber of Horrors”.' The curatorial content in the V&A's Contemporary programme is once again becoming as relevant to the wider world as its timing, pricing and more, and should be commended. The V&A is responding to current global events in a way that other London institutions programming design and architecture simply are not. The V&A also presents a broad programme featuring exhibitions and events of a wide variety, at different times of the day, week and year and at different price points, offering a lot of its programme free of charge. Again, few other London institutions do this. It should be noted that comparisons between the V&A and places such as the Design Museum, the Barbican Centre and other organisations presenting contemporary design and architecture may not be entirely fair: the V&A is the longest-standing institution presenting design in London by a long stretch, had enjoyed healthy government funding for much of its history, and has the strength of its enormous collections to rely on to always bring an audience and always provide its curators rich resources with which to work. Therefore to compare the V&A's large programming offering with the Design Museum's comparatively small one, or the V&A's dedication to design and architecture to the Barbican Centre's multiple artform programming, or the Royal Academy's largely paid-for programming with the V&A's abundant free offerings would miss the mark. The V&A is in a unique position to deliver much of what it does, but its renewed examination of design and society could be echoed anywhere else, yet is not. I don't believe another London institution, big or small, new or old, is discussing design and architecture's role in our social and political landscape to the same extent as the V&A is right now. While the V&A holds quite a unique position within London's – even the world's – cultural institutions, and therefore has strengths it can draw upon that other museums cannot, it nevertheless approaches contemporary programming in an inventive and holistic way. The V&A's Contemporary programme offers much to people in ways that limit time or financial barriers. The Museum has seen record visitor figures in recent years (3.2 million in 2012/13) and has, over time, returned to the public-centric values of its founder, Henry Cole. Quoted in the V&A's most recent Annual Review, Chief Operating Officer Tim Reeve says this: 'it is self-evident that museums are as much about people as collections. All of the big decisions we make should be based on rigorous research of audiences – existing and potential. Every new project should start by standing in the visitor’s shoes and designing journeys and experiences from that perspective.' But perhaps the spirit of openness that a varied programme which welcomes visitors morning and evening all year round, often with no charge, is best summed up with the words of Cole himself: ‘This museum will be like a book that is open and not shut’.